Peter= 8.5 / 10; Ryan = 8.5 / 10; Roean= 8 / 10; Simran= 9 / 10; Andrew = 9 /10. At a time where Japan faces overpopulation, a class of young students is taken onto an island to participate to a deadly cruel game. 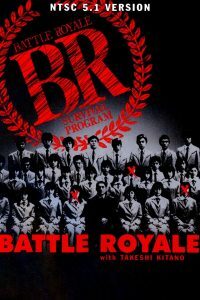 Battle Royale is based on the awesome idea of sticking schoolmates on an island and having them to fight to death, until only one remains. Now you think this is a mad idea? Well the film is even madder! The propaganda style of the first quarter of the movie is hilarious. This super-enthusiast woman presenting the video makes it look as if it was totally normal! As the game starts, we discover the range of cool (or not so cool for some) weapons. The massacre then starts immediately and won’t stop until the end. There is a good amount of gory scenes and the various kills are really fun to watch. Only in the middle of the movie you have to bear one of these boring love story. The ending is totally fucked up, I still do not fully understand it after multiple viewing of that film. Nevertheless it is a wonderful piece of horror, and a great classic that makes Hunter Games looks like a Disney Cartoon!